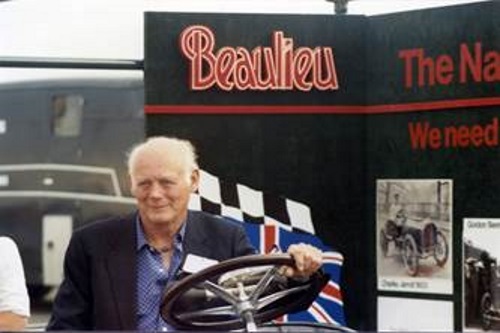 It is with great regret that the Club has to announce the death of Honorary Member Lord Montagu of Beaulieu on 31 August at the age of 88 after a short illness. He had been an Honorary Member of the BRDC since 1993. Lord Montagu was one of the pioneers of the stately home industry. He first opened his home, Palace House, to the public in 1952 with a display of cars in the entrance hall. By 1956 the vehicle collection, which now included several motorcycles, had outgrown the house and Lord Montagu established a separate home for the exhibits in some large buildings. In 1972 the Montagu Motor Museum was relaunched as the National Motor Museum, displaying more than 250 vehicles from the 19th century onwards. Also in 1956 Lord Montagu launched Veteran and Vintage magazine, which he published until its sale to IPC in 1979 (it later became Collectors’ Cars and eventually Classic Cars). Lord Monatgu was a leading motoring historian and the author of a number of authoritative books on motoring history. He was a regular participant in the London to Brighton run. As a member of the House of Lords Lord Montagu was a staunch advocate of heritage causes and played a crucial role in the establishment of the Historic Houses Association which led to his appointment in 1984 as the first Chairman of English Heritage. The funeral of Lord Montagu will take place on Thursday 10 September in Beaulieu Abbey at 3pm. The funeral hearse will pass through the village of Beaulieu, leaving Palace House at approximately 2.40pm. Places in the Abbey Church will be limited to the family and friends of the late Lord Montagu, with an audio relay for other attendees in the Cloister. Donations are requested to the National Motor Museum Trust and the Countryside Education Trust.